On average most teams will raise much more than this creating a larger impact. We will provide you with a fundraising toolkit and pledge sheets. Gather your coworkers, friends or family and join Joy Ride! Teams will embark on a 12-hour stationary spin at this energetic and fun filled event. Pedal hard or soft; the intensity of your ride is up to you! The more people on your team, the more ways you can divide your 12 hours. One person from your team must be riding at all times. Ride for 3 hours or ride for 15 minutes—but whatever you do, don't stop riding. When you register, choose the time slot and number of bikes that best fits your team. 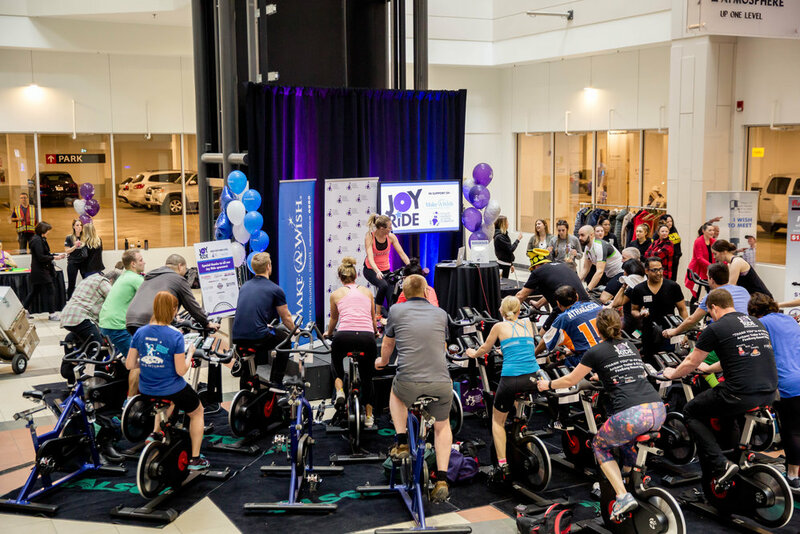 This custom bike-a-thon experience could consist of one bike for 12 hours, two bikes for 6 hours, three bikes for 4 hours…there are many options to choose from! Time slots and bikes are subject to limited availability on a first-come-first-serve basis.